Why black and not white, like at Calumet and some of the other big farms? Black paint wears better. You can paint black fencing once every five years and have it still look great. The white paint shows chips a lot faster. You'll need to repaint the white fence every two years. Why do people choose 4-boards over 3-boards? It's simple! Some horses like to put their heads through the 3-board fencing to eat the grass on the other side. All is well until they over-react and try to pull their heads up suddenly, often removing a board or two, or even worse, breaking their jaw. On which side of a post should you attach the boards? Always put the boards on the pasture side of the post. That way when the horses (or other livestock) push on the fence boards while leaning over the fence or itching on it, the boards won't pop loose. Placing the posts on the interior of the pasture is also a hazard to the horses, since they can run into the posts and injure themselves. Typically, a well-built wood fence will have a 6" in diameter, oak post every eight feet. A face board is a board that runs perpendicular to the ground, on the outside of the boards on the opposite side from the post. Face boards keep the boards from popping loose from the post. 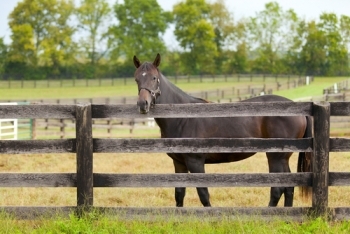 A loose board that protrudes into the pasture is a safety risk for a horse. The face board also keeps the fence looking tidier. However, face boards trap moisture between boards, which may cause the fence to rot quicker. If you drive around looking at the major farms you will see some with face boards and some without. Most farms try to use oak boards because oak lasts longer and is stronger than most of the other fencing wood available. Poplar is somewhat popular, especially with sport horses when you can use electric wire on top, because the wood stays straighter than the oak boards. In other parts of the country, cypress, locust, etc. are often the wood of choice for posts. Some farms also have wire fencing, is it safe? Diamond wire mesh fencing with a board on top is the safest and one of the most expensive fencing types around. The wire is extremely thick and densely knit, and not as "classic" in appearance. Diamond wire mesh is extremely durable and very low maintenance. 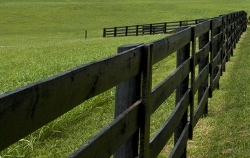 No climb wire (pictured right) is a wider, less dense and less durable type of fencing that is still safe for horses because the horse can't get a foot through it. However, no climb wire has a much shorter life expectancy than diamond wire mesh. 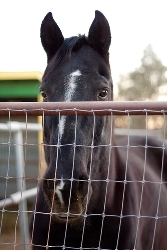 Other types of wire, such as hog wire and barbed wire, can be dangerous for horses. Hog wire is too wide, so horses can catch their leg in it, and barbed wire will tear horses' coats. 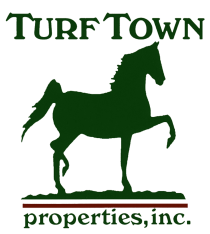 Electric wire is safe, but not used as extensively for high-strung horses. When thoroughbreds (and many other types of performance horses) touch hot wire they tend to react poorly and don't always stay within the fence. Plastic fencing, such as Triple Crown Fencing, is safe and extremely durable. Unfortunately it is also quite expensive to install and for many people it does not have the "classic" appeal. These two factors make it a less popular choice here in Central Kentucky.